The Talk ‘N Text KaTropa has eliminated the Barangay Ginebra San Miguel and is now scheduled for a best-of-seven series against the waiting San Miguel Beermen in the Finals. So it’s now confirmed, Joshua Smith is suffering from an injury and it’s not a shoe problem. 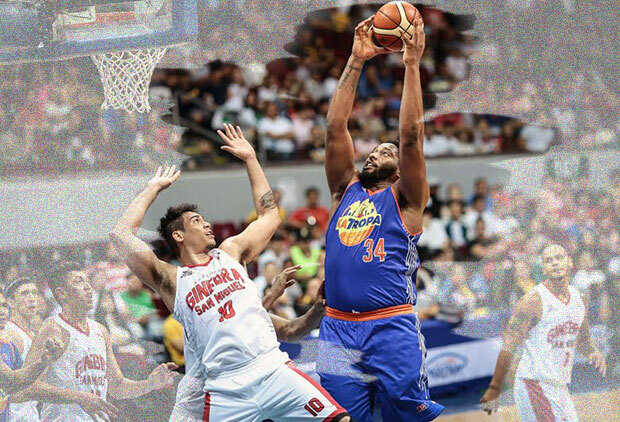 That scenario gives TNT a much needed morale boost as this will be the last game of the man known as the “Jumbotron” in 2017 PBA Commissioner’s Cup. KaTropa local players have a tape in their jersey with the number 34, a what it seems tribute to their unstoppable import. Just like what Magoo Marjon said during the live telecast, Jayson Castro doing what Jayson Castro does. The man who is also dubbed as the best point guard in Asia dropped 38 points along with his 11 assists. At 8:51 mark in the fourth quarter, Barangay Ginebra looked sharp after Japeth Aguilar converted an elbow jumper. Gin Kings was leading 103-98. Then Talk ‘N Text started to knock the doors of the Gin Kings as Ranidel de Ocampo led Texters comeback with his five straight points. He converted a lay-up and three-pointer. LA Tenorio answered the mini-run of KaTropa as he also splashed his own version of three-pointer, 106-103. That quite run was immediately turned into a TNT avalanche as the players of coach Nash Racela went unconscious and unleashed a 16-1 turnaround. Barangay Ginera found no answer from their end instead missed shots and turnovers until the last buzzer was heard. Game 1 of the Talk ‘N Text KaTropa Texters versus San Miguel Beermen is scheduled this coming Wednesday.